White porcelain dinnerware is a favorite of many, from professional chefs to homemakers. It is also a top choice of event organizers as well because of its flexibility in creating awesome table settings. Chefs like it because it is a fabulous backdrop that doesn't compete with aesthetics of creative dishes. Homemakers like it because it is beautiful, durable and easy to take care of. The quality of porcelain dinnerware is astounding, to say the least. Is actually fine china, but it is ideal for use as casual, everyday dinnerware. Porcelain tableware is non-porous, which makes easy to take care of. It is fired at a high-temperature which makes the surface strong and durable. 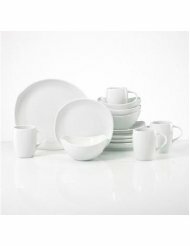 Without all of the fancy decorations, white dinnerware made of porcelain is microwave safe and dishwasher friendly, which make it well-suited for a modern family. If you are looking for trouble-free, flexible dinnerware to meet the needs of family, white porcelain dinnerware is an excellent choice. Who Offers White Dinnerware Made of Porcelain? Believe it or not, many dinnerware brands offer white porcelain sets, or open stock options. White dinnerware is high in demand and dinnerware manufacturers know that. Many restaurants choose white dinnerware , and porcelain tableware is a top choice because of its high quality. Way back when, porcelain was kind of reserved for fine dining, but it modern days it has become a favorite for casual dinnerware sets. 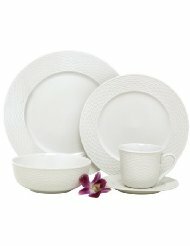 White dinnerware sets are widely available in many designs and patterns. The prices range from low to high, but I am sure that you will able to find a set that fits into your price range with the enormous variety of choices. Personally, I love white dishes. I have tried a few different kinds of white dinnerware, and above all, white porcelain is my favorite. It is versatile in use, flexible in creating table settings, durable and strong, and caring for it easy. Porcelain dishes don't chip or scratch easily. It is suited to use in the microwave or dishwasher which is a prerequisite for my lifestyle. It holds up to the daily needs of my family and continues to look beautiful.